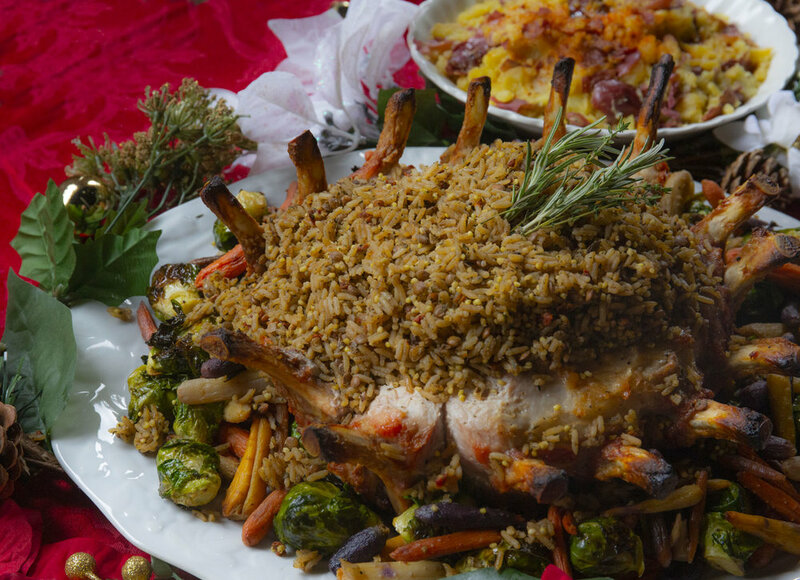 Organic Heritage Medley makes a hearty, savory stuffing for elegant Pork Crown Roast, a show-stopper on any holiday table. A well-balanced blend of lentils, white rice, and millet, Organic Heritage Medley is pre-seasoned with an umami-rich combination of mushrooms, sun-dried tomatoes, garlic, onion, herbs, and spices that perfectly compliments the flavor of roasted pork. Trim and tie pork loins to create the crown roast (or have a butcher prepare this). Heat and oven to 300 degrees F. with a rack on the most bottom position. Toss the vegetables in a bowl with olive oil and 1 tablespoon of (seasoning) and set aside. Rub the inside and outside of the pork generously with (seasoning). Wrap the bones in aluminum foil to protect the color if desired. Roast the pork for 50 minutes and remove to rest, adjust the oven temperature to 450 degrees F.
Surround the pork with the vegetables and return to the oven. Roast for 30-40 or until a thermometer reads 155 degrees F.
While the roast cooks at this point bring 4 cups of water to boil with 2 cups of Organic Heritage Medley and 2 tablespoons of butter. Allow this to simmer on low with a cover for 20 minutes. Remove the Organic Heritage Medley to stand covered for 5 minutes and remove the pork roast when at proper temperature. Serve the roast with vegetables and fill the cavity with the rice fusion. Organic Heritage Medley is a hearty combination of rice, lentils, and millet, seasoned with savory mushrooms, sun-dried tomatoes, and an aromatic medley of herbs and spices.